Greene Valley Forest Preserve in Woodridge is only 10 miles south of my home. So why had I only been there once or twice before? Well, until this past week, I guess I didn't know what I was missing. Multiple reports of a very accessible Acadian flycatcher was my catalyst. The bird was first reported on June 6 by Mike Madsen, a veteran birder who knows every inch of Greene Valley--he's been monitoring birds there for years. Mike heard and then sighted the flycatcher in an open scrubby area, which is not typical habitat for an Acadian. It was the first time he had ever seen this species at Greene Valley. Since I had never seen an Acadian flycatcher in my LIFE, I paid close attention to his reports on IBET, the birding list-serve. And the postings kept coming. Not only was the bird out of place, it was hanging around! On June 20 I decided to go for it. It was a beautiful cool morning--a great day to be out after about a week of hot and sticky conditions. The night before and in the car on the way, I played the empidonax flycatcher track from my Birding by Ear CD series. I played the Acadian segment over and over, trying to burn that sound into my head. The homework paid off. Once at Greene Valley I located the bird fairly easily--it was right where Mike described it. Naturally I heard the flycatcher first. But within a few minutes I was watching it sing from fairly close range. As birders know, it's very satisfying to find a sought-after "life bird" and be able to observe it at length and in good light. Even better when the bird is vocalizing. The Acadian made my day, but there was more to be enjoyed. I proceeded along the crushed limestone paths of Greene Valley and found Baltimore and orchard orioles, yellow warbler, common yellowthroat, Eastern towhee and indigo bunting--all nice birds to watch and listen to. Catbirds and red-winged blackbirds were especially plentiful. Around 7:00 a.m. I reluctantly got back in my car and headed home--it was Wednesday and I had to get to work! After a quick change and a commute on Metra, I was in my Chicago office before 9. Three days later I found myself back at Greene Valley, this time in a light rain. Like the previous visit, I had a target bird: Bell's vireo. If successful, it would be my second lifer of the week. Well, sometimes the birding gods get even. They decided to make me really work for the Bell's. And I'm still working. I didn't find one that day in the drizzle, or the next day either. Nice consolations were a white-eyed vireo and a yellow-billed cuckoo. I'll take those birds any day. But my lifer Bell's will have to wait. Maybe this Saturday my luck with turn. Bell's vireos are confirmed at Greene Valley--my birding colleagues have been finding them with relative ease in recent weeks. They've told me where to look and I know what to listen for. It's a matter of persistence and timing. So I'll keep trying in the days to come, and I'll keep enjoying Greene Valley. It has more to offer than I ever realized. Several few years ago I won some kudos for spotting a peregrine falcon during the spring bird count. 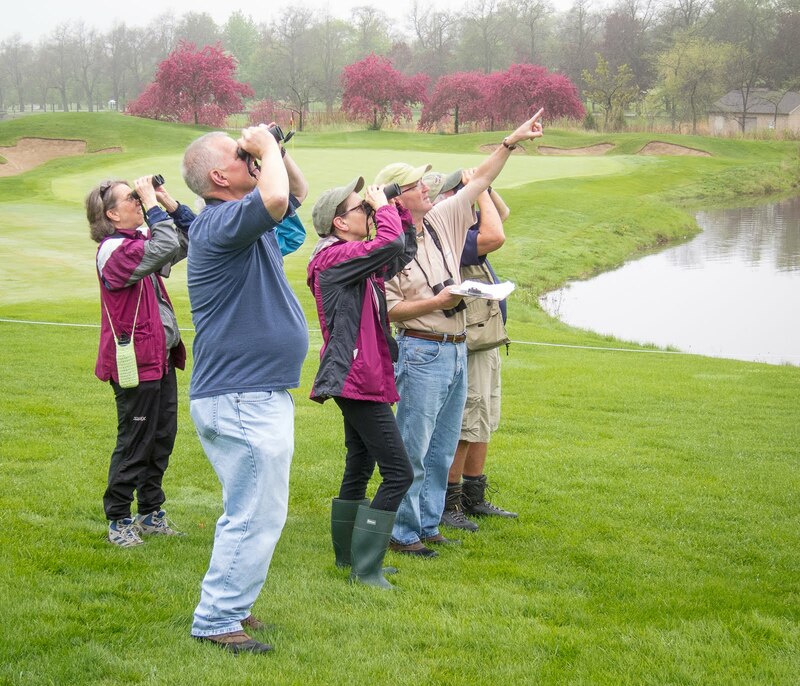 I was with two other birders covering the Morton Arboretum when I saw the bird high overhead and called out. It was a rather improbable sighting, but my colleagues--more experienced than me--confirmed the ID. I enjoyed that moment, and I recalled it on May 27 when I saw only my second lifetime peregrine falcon in DuPage County--this time from my back patio! The peregrine was a new "yard bird" for me, species No. 104, and obviously one of the highlights of my spring birding. During May, the peak of migration season, I was out on the patio almost every morning just before 6 a.m., listening and looking. Even on work days I squeezed in an hour of birding before heading for the train. So a lot of early wake-ups, but it was worth it. The same day I saw the falcon, I also spotted a yellow-billed cuckoo. I'd only had a cuckoo in the yard once before, in May 2005, so it was quite a surprise. Another bird I'd only had once before was Eastern kingbird, a fairly easy bird to find if you know where to look. But until May 4--and then again on May 27!--I hadn't seen a kingbird in my yard since 2002. It was good to end a five-year drought. Another sweet May moment was finding a rose-breasted grosbeak on my sunflower seed tube feeder one morning when I first went outside. Fortunately he startled me more that I startled him so he stayed for a few minutes. It would be my only grosbeak of the spring. In the warbler department it was a so-so May in my yard. I logged a dozen varieties, among them Blackburnian, chestnut-sided, blackpoll, black and white, Wilson's and bay-breasted. Vireos? Just two: red-eyed (of course) and blue-headed (alright!). This spring I really got to know the beautiful song of the Swainson's thrush. I'm not sure if it was one bird or several different ones, but Swainson's was "uncommonly common" in my yard during the second half of May. Most mornings I never saw one but boy did I hear it. Brown thrasher is a bird I can never count on. Before last month I'd only had two yard sightings, once in late April and once in very early May. It was therefore kind of shocking to have one stop by on May 28--a true "bonus bird." He was perched fairly high in a neighbor's tree and making all the weird sounds you'd expect from a thrasher. One species I expected to see (or at least hear) was gray catbird, one of my favorite backyard birds. No luck. But if birding is anything it's unpredictable. For 2007, my yard list now sits at 74 species. This is my fifth straight year of keeping a "year list" for the yard, and so far my highest total is 79 species, in 2005. With a little luck--and a lot more hours on my patio this fall--a new personal best is within reach. A flyover bald eagle for No. 80 would be nice. But a catbird would be fine, too.